This bedroom is wonderfully light and airy. Blissfully peaceful, perfectly pleasant and nicely appointed. I like the painted reclaimed wood floors – a little design on the floor in lieu of a rug. A great shade for the blue upholstered Holly Hunt chair that coordinates well with the Leontine Linens boudoir pillow. Some people like to have their bedrooms dark and mysterious with no light allowed in…I prefer to wake up to sunlight for some reason. Morning natural light keeps me cheerful throughout the day. 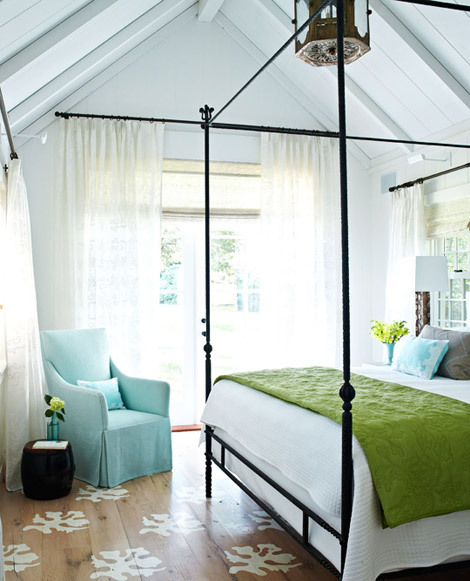 The pitched ceiling makes plenty of room for the iron canopy bed. 1, 2, 3 just like that (or I’m sure with some great thought)…this room is quite cute…good designed! 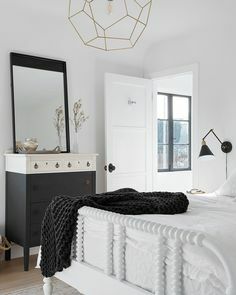 What do you think of this bedroom? What might you add or subtract? Is it too light and bright for you or is it just right? P.S. Sorry I didn’t blog yesterday…was running around in the morning before work doing COCOCOZY textiles collection work – work before work and work after work…that’s been my schedule these days. We have lots and lots of orders to fill from the New York International Gift Fair and the Atlanta gift show…so I was up to my ears in sorting out fabric, orders and the like early yesterday morning instead of working on a blog post. So much to do. I’m enjoying it though. Really loving the challenge of starting a textiles business from the ground up. All is good. Well, to be honest, have been fretting way too much as of late because my web guy has gone MIA and I can’t get many of the new pillows on the shop site for you to see and there are a million glitches on the shop site. Oy. Any suggestions? On my web dilemma that is? Anyone want to give me a crash course in website building (or at least know someone who could help)? Au secours! P.P.P.S. You might wonder why I have two long dresses for the Emmys…well to make a long story short or in this case a short story long…I own several long gowns actually, and long white kid leather gloves and I even have a long wonderful hunter green opera coat (I don’t really know what an opera coat is but it is big enough to wear over a ball gown I was told and is quite lovely…bought it for no reason years ago at Barneys). My sister thinks I’m totally wacky because I have so many long dresses (at least I don’t own a tiara…hmmm…not a bad idea…oh I forgot, I must have at least 5 very sparkling headbands…went through a sparkling headband phase last year…that phase has passed…I mentioned them almost every day on the blog…so I’m sure you are glad that phase passed too…). Well you never know when prince charming may swing by in tuxedo and ask you to a wonderful black tie event…right? Better to be prepared. Forget earthquake preparedness, I am black tie event prepared…horrifying, I know…but it’s true. The good news is the gowns are not going to waste; this year, I’ve offered several of my gowns out to some of the other girls at work who don’t have anything to wear to the Emmys…so far, someone has taken me up on a blue Vivienne Tam chiffon dress…am bringing in a Monique L’Huillier today for someone else to try. Need prince charming in the tux to appear soon before I lend out all of my dresses and don’t have a thing to wear. Oh my! P.P.P.P.P.S. I recognize this P.S. section is a bit out of control…but who says the P.S. can’t be longer than the “S”? Maybe I’m a writing and grammar trailblazer with this? Maybe I’ve invented something? Hmmm…. Oy. Eight. haha I enjoyed your “kind of PS longer than the post” I vote for the one shoulder dress, If you are not so sure about it I think its the perfect time to rock it! it’s an event where you could wear anything you want so go for it! have to say i still love sparkling headbands though I rarely wear them.. I love going out of town and wear everything I don’t dare to wear around.. and regarding the original post I like the light as well… ever since I saw the lauren gold yellow headboard in her room I changed from mysterious to energetic! I think there might be a coffee to oy ratio here and definitely a coffee to “P”ratio(P as in PS not pee). Go with the navy and sparkle, one-shoulder dress, Coco. Too many wear basic black. I went to the Emmies in 1975. A gal had on the exact same gown as myself. I was mortified. Stick with the one from Paris. Besides, you’ve never worn it! Oh, and I love the bedroom but love your p.s.’s even more. You are too cute! One caveat with a one shoulder dress- make sure you get a FABULOUS push up bra. Get a little padding even unless you totally don’t need it. Because one shoulders tend to make you look droopy otherwise-and just on one side! Coco how exciting and I cannot wait to see you in your dress (the one shoulder navy)! I am more into the fashion at the moment than the bedroom although it is very nice! I think this bedroom is so pretty. It’s light and airy and cheerful! But I am one of those people who likes my bedroom to be dark and cocoon like with no light seeping in. I like that room, but I couldn’t sleep in it!